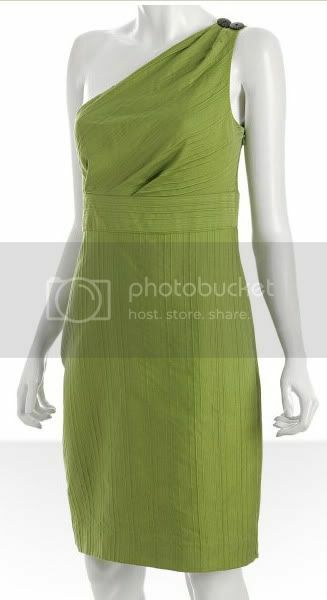 Description: Asymmetrical neckline with single shoulder strap; fitted; invisible side zipper; gathers at empire waist. Pattern Sizing: 4 - 16, I cut the 14 in the bodice and graded up to a 16 at the hip. Fabric: A denim-looking striped fabric. Fiber content is unknown but it does contain lycra. What did you particularly like or dislike about the pattern? I've been wanting to sew a one-shoulder dress for a while now and I really liked the style of this pattern so I thought I'd give it a shot. They only thing I didn't like about this dress pattern is that there wasn't a lining drafted. Pattern Alterations or any design changes you made: I cut the longest version of view C and didn't have to make my normal lengthening alteration. I cut the bodice in the size 14 and graded to the 16 to accomodate the widest point of my hips. Conclusion: I love the style of this dress, but I hate the fabric I selected. It wrinkles like crazy! From the pictures, it looks as if I've been sitting all day in this dress. Those wrinkles are from just putting it on. I had planned on adding a lining, but as I worked I realized I just didn't love the fabric. Let's call this a "wearable muslin". I'm sure there will be a NL 6912 2.0 -- in better fabric!